The phenomenal infrastructural growth across the globe has created a huge demand for energy in several direct and indirect ways. The unprecedented rate of industrialization has also led to a huge need for energy, thereby triggering coal trading activities. An analysis published by Transparency Market Research states that 42% of the overall energy generation can be attributed to coal. Keeping true to this statement, analysts have predicted that coal trading will stand at 10,951 million tons (MT) by 2023. The market, by volume, was 8,086 million tons (MT) in 2014. Between 2015 and 2023 the market is expected to rise at a CAGR of 3.43% in terms of volume. Coal trading is also going to be facilitated by the fact that it is an exceptionally cheap commodity as compared to natural gas and oil. Its deep reserves also make it is a safe raw material for the production of energy. Furthermore, coal is available abundantly, commonly, and requires low-cost logistics, making it the best possible option for meeting the energy demands of the world. The rise in the coal trading activities is also attributable to the score of coal companies expanding their operations in the near future. The lignite product segment is anticipated to grow more than the other product segments due to its increasing usage in the iron, power, and steel industries. This growth will be supported by the low cost of production involved in setting up lignite-fired power plants. Furthermore, it also happens to be the most affordable product and has a low calorific value. The biggest hurdle in the demand for lignite is the transportation challenge due to the high content of moisture present in lignite. However, coal traders are overcoming this obstacle by setting up their power plants close to the mines. With this scenario, the lignite coal product segment is anticipated to expand at 3.04% CAGR in the same forecast period. Asia Pacific is steering the growth of the coal trading market, fueling its activities with a fast-pace industrialization and a list of ongoing infrastructure projects. Thus, the humungous amount of power required by these elements is largely determining the establishment and expansion of power plants to cater to the electricity demands. The burgeoning economies of China and India are anticipated to keep coal trading activities in top gear due to the ever-increasing population that will demand energy in the coming years. The players forming the core of the competitive rivalry in the global coal trading market are Arch Coal Inc., PT Adaro Energy Tbk., Coal India Limited, PT Bumi Resources Tbk., Glencore Plc, Siberian Coal Energy Company, China Shenhua Energy Company, BHP Billiton Limited, Anglo American Plc., and , Peabody Energy Corporation. The competition in the overall market is exceptionally stiff due to the presence of a few players. In the coming years, the companies are anticipated to partner with regional players to get easy access to new markets and establish operational stability. 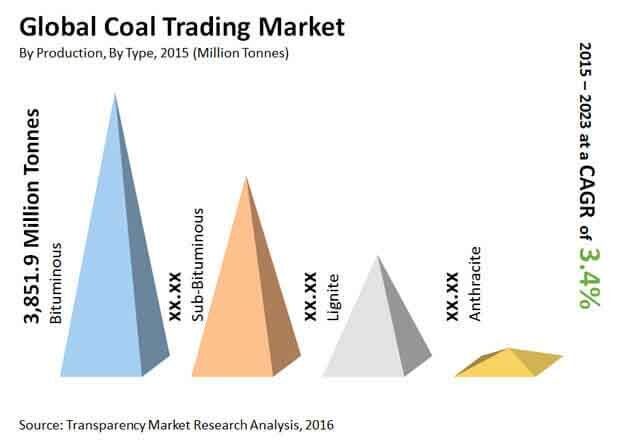 This research study analyzes the market for coal trading market in terms of volume (million tonnes). The market has been segmented on the basis of type, application and region. The global coal trading market has been segmented into five regions: North America, Europe, Asia Pacific, Middle East & Africa, and South & Central America. For the research, 2014 has been taken as the base year, while all forecasts have been given for the period from 2015 to 2023. Market data for all type and application has been provided at the regional as well as country-specific level from 2015 to 2023. The report provides a broad competitive analysis of companies engaged in the coal trading business. The report also includes the key market dynamics such as drivers, restraints, and opportunities affecting the global coal trading market. These market dynamics were analyzed in detail and are illustrated in the report with the help of supporting graphs and tables. The report also provides a comprehensive analysis of the global coal trading market with the help of Porter’s Five Forces model. This analysis helps in understanding the five major forces that affect the market structure and market profitability. The forces analyzed are bargaining power of buyers, bargaining power of suppliers, threat of new entrants, threat of substitutes, and degree of competition. Coal is the most widely available fossil fuel resources and forms the backbone of world’s electricity supply. Coal is the key component in production of iron, steel and cement which is a vital material in building sustainable societies. Consumption of coal is high in power industry. In terms of types, coal can be segmented into lignite, sub-bituminous, bituminous and anthracite. It is employed in various sectors such as power, iron and cement. Consumption of coal is one of the important economic indicators to gauge the growth potential of any region. Challenge of energy poverty and global warming issues is the main driver for investments in clean coal technology. National, international and financing policies must support usage of the most efficient and cleanest coal technology. The high-level analysis in the report provides detailed insights into the coal trading business globally. There are currently numerous drivers of the market. One of the most prominent drivers is the rise in power sector. Market attractiveness analysis was carried out for the coal trading market on the basis of geography. Market attractiveness was estimated on the basis of common parameters that directly impact the market in different regions. Transportation cost plays a vital role in determining the final price of coal traded in the market. It constitutes a huge share of the total price of the coal. Demand for coal would be dependent on its price in the international market. Rise in industrial development in Asia Pacific is a major driver for the coal trading market in the region. North America was the second-largest market for coal trading in 2014. The market in North America and Rest of the World experienced sluggish growth in the year. However, growth in infrastructure activities is anticipated to boost market growth in these regions in the near future. China, and India are likely to emerge as high potential markets for coal trading in Asia Pacific. The coal trading market was segmented on the basis of type into lignite, sub-bituminous, bituminous and anthracite. Coal was segmented on the basis of application such as power, iron, cement and others. The coal trading market was analyzed across five geographies: North America, Europe, Asia Pacific, Middle East & Africa, and South & Central America. Regional data has been provided for each sub-segment of the coal trading market. Key players in the market include Arch Coal Inc., Coal India Limited, PT Adaro Energy Tbk., PT Bumi Resources Tbk., China Shenhua Energy Company, Glencore Plc, Siberian Coal Energy Company, BHP Billiton Limited, Peabody Energy Corporation, and Anglo American Plc. The report provides an overview of these companies, followed by their financial details, business strategies, and recent developments.